Transcription regulator protein BACH2 is a protein that in humans is encoded by the BACH2 gene. 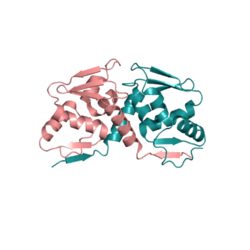 It contains a BTB/POZ domain at its N-terminus which forms a disulphide-linked dimer  and a bZip_Maf domain at the C-terminus. ↑ "Diseases that are genetically associated with BACH2 view/edit references on wikidata". ↑ Sasaki S, Ito E, Toki T, Maekawa T, Kanezaki R, Umenai T, Muto A, Nagai H, Kinoshita T, Yamamoto M, Inazawa J, Taketo MM, Nakahata T, Igarashi K, Yokoyama M (Aug 2000). "Cloning and expression of human B cell-specific transcription factor BACH2 mapped to chromosome 6q15". Oncogene. 19 (33): 3739–49. doi:10.1038/sj.onc.1203716. PMID 10949928. ↑ Kamio T, Toki T, Kanezaki R, Sasaki S, Tandai S, Terui K, Ikebe D, Igarashi K, Ito E (Nov 2003). "B-cell-specific transcription factor BACH2 modifies the cytotoxic effects of anticancer drugs". Blood. 102 (9): 3317–22. doi:10.1182/blood-2002-12-3656. PMID 12829606. ↑ "Entrez Gene: BACH2 BTB and CNC homology 1, basic leucine zipper transcription factor 2". ↑ Rosbrook GO, Stead MA, Carr SB, Wright SC (Jan 2012). "The structure of the Bach2 POZ-domain dimer reveals an intersubunit disulfide bond". Acta Crystallographica Section D. 68 (Pt 1): 26–34. doi:10.1107/S0907444911048335. PMID 22194330. Oyake T, Itoh K, Motohashi H, Hayashi N, Hoshino H, Nishizawa M, Yamamoto M, Igarashi K (Nov 1996). "Bach proteins belong to a novel family of BTB-basic leucine zipper transcription factors that interact with MafK and regulate transcription through the NF-E2 site". Molecular and Cellular Biology. 16 (11): 6083–95. doi:10.1128/mcb.16.11.6083. PMC 231611 . PMID 8887638. Kobayashi A, Yamagiwa H, Hoshino H, Muto A, Sato K, Morita M, Hayashi N, Yamamoto M, Igarashi K (Mar 2000). "A combinatorial code for gene expression generated by transcription factor Bach2 and MAZR (MAZ-related factor) through the BTB/POZ domain". Molecular and Cellular Biology. 20 (5): 1733–46. doi:10.1128/MCB.20.5.1733-1746.2000. PMC 85356 . PMID 10669750. Hoshino H, Kobayashi A, Yoshida M, Kudo N, Oyake T, Motohashi H, Hayashi N, Yamamoto M, Igarashi K (May 2000). "Oxidative stress abolishes leptomycin B-sensitive nuclear export of transcription repressor Bach2 that counteracts activation of Maf recognition element". The Journal of Biological Chemistry. 275 (20): 15370–6. doi:10.1074/jbc.275.20.15370. PMID 10809773. Vieira SA, Deininger MW, Sorour A, Sinclair P, Foroni L, Goldman JM, Melo JV (Dec 2001). "Transcription factor BACH2 is transcriptionally regulated by the BCR/ABL oncogene". Genes, Chromosomes & Cancer. 32 (4): 353–63. doi:10.1002/gcc.1200. PMID 11746976. Muto A, Tashiro S, Tsuchiya H, Kume A, Kanno M, Ito E, Yamamoto M, Igarashi K (Jun 2002). "Activation of Maf/AP-1 repressor Bach2 by oxidative stress promotes apoptosis and its interaction with promyelocytic leukemia nuclear bodies". The Journal of Biological Chemistry. 277 (23): 20724–33. doi:10.1074/jbc.M112003200. PMID 11923289. Takakuwa T, Luo WJ, Ham MF, Sakane-Ishikawa F, Wada N, Aozasa K (Mar 2004). "Integration of Epstein-Barr virus into chromosome 6q15 of Burkitt lymphoma cell line (Raji) induces loss of BACH2 expression". The American Journal of Pathology. 164 (3): 967–74. doi:10.1016/S0002-9440(10)63184-7. PMC 1614712 . PMID 14982850. Tashiro S, Muto A, Tanimoto K, Tsuchiya H, Suzuki H, Hoshino H, Yoshida M, Walter J, Igarashi K (Apr 2004). "Repression of PML nuclear body-associated transcription by oxidative stress-activated Bach2". Molecular and Cellular Biology. 24 (8): 3473–84. doi:10.1128/MCB.24.8.3473-3484.2004. PMC 381671 . PMID 15060166. Motamed-Khorasani A, Jurisica I, Letarte M, Shaw PA, Parkes RK, Zhang X, Evangelou A, Rosen B, Murphy KJ, Brown TJ (Jan 2007). "Differentially androgen-modulated genes in ovarian epithelial cells from BRCA mutation carriers and control patients predict ovarian cancer survival and disease progression". Oncogene. 26 (2): 198–214. doi:10.1038/sj.onc.1209773. PMID 16832351. Yoshida C, Yoshida F, Sears DE, Hart SM, Ikebe D, Muto A, Basu S, Igarashi K, Melo JV (Feb 2007). "Bcr-Abl signaling through the PI-3/S6 kinase pathway inhibits nuclear translocation of the transcription factor Bach2, which represses the antiapoptotic factor heme oxygenase-1". Blood. 109 (3): 1211–9. doi:10.1182/blood-2005-12-040972. PMID 17018862. Ono A, Kono K, Ikebe D, Muto A, Sun J, Kobayashi M, Ueda K, Melo JV, Igarashi K, Tashiro S (Jan 2007). "Nuclear positioning of the BACH2 gene in BCR-ABL positive leukemic cells". Genes, Chromosomes & Cancer. 46 (1): 67–74. doi:10.1002/gcc.20390. PMID 17044046. Ikeda T, Shibata J, Yoshimura K, Koito A, Matsushita S (Mar 2007). "Recurrent HIV-1 integration at the BACH2 locus in resting CD4+ T cell populations during effective highly active antiretroviral therapy". The Journal of Infectious Diseases. 195 (5): 716–25. doi:10.1086/510915. PMID 17262715. Hoshino H, Nishino TG, Tashiro S, Miyazaki M, Ohmiya Y, Igarashi K, Horinouchi S, Yoshida M (May 2007). "Co-repressor SMRT and class II histone deacetylases promote Bach2 nuclear retention and formation of nuclear foci that are responsible for local transcriptional repression". Journal of Biochemistry. 141 (5): 719–27. doi:10.1093/jb/mvm073. PMID 17383980.